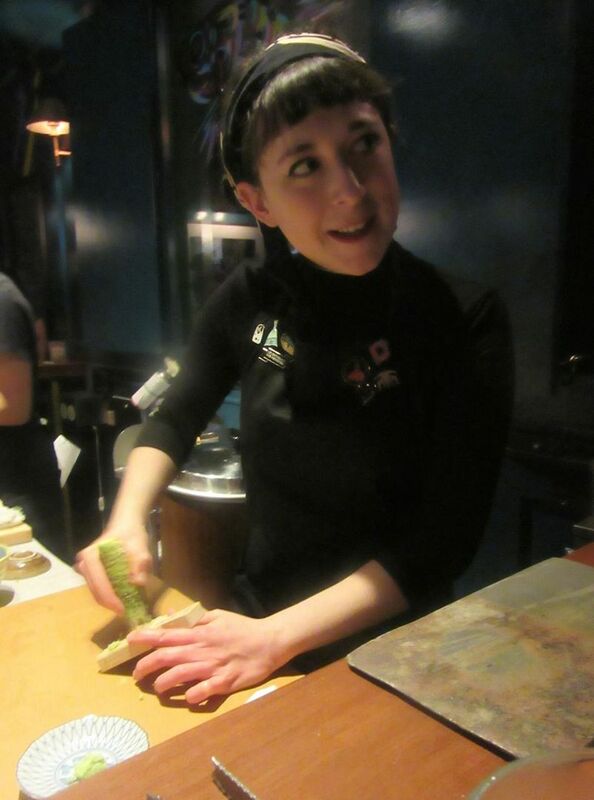 Oona Tempest avoids the hassle of being a female sushi chef by running her own counter. It took two omakase sessions at Sushi by Bae to seduce me. I was definitely resisting the first time I put myself into the small white hands of Oona Tempest. I found the sushi setup in the giant, mostly deserted Gansevoort Market disturbingly downmarket. Tonight’s tasting launches with firefly squid, uni from Maine, lightly pickled eggplant and just-grated wasabi. I’ve been spoiled by the precision of the masters: Don Pham, first at O Ya and then at Sushi Ishikawa, Nick Kim and Jimmy Lau at Shuko, Satsuki at Suzuki. By comparison this struck me as child’s play in the garage: a duo of sushi gambits in different tempos at a single counter. 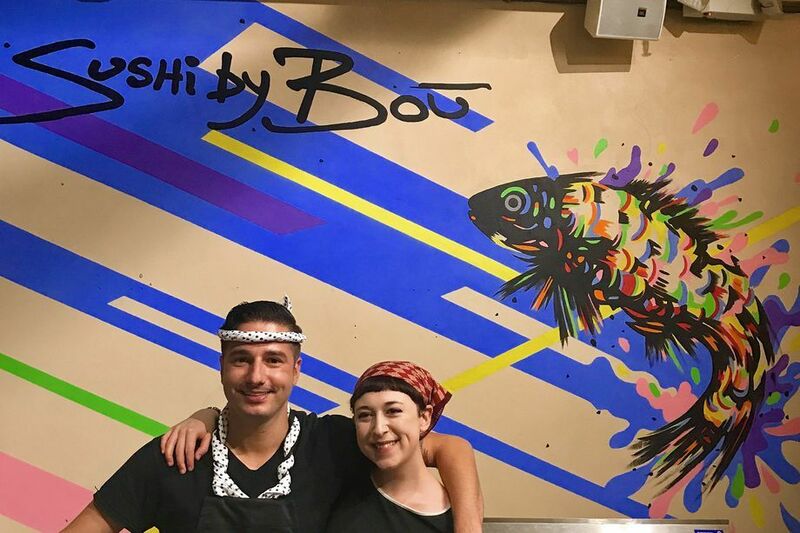 A $50 30-minute everyday sushi experience by David Bouhadana’s Sushi by Bou bumped up against Tempest’s 90-minute $100 sushi unwinding at a quartet of stools. 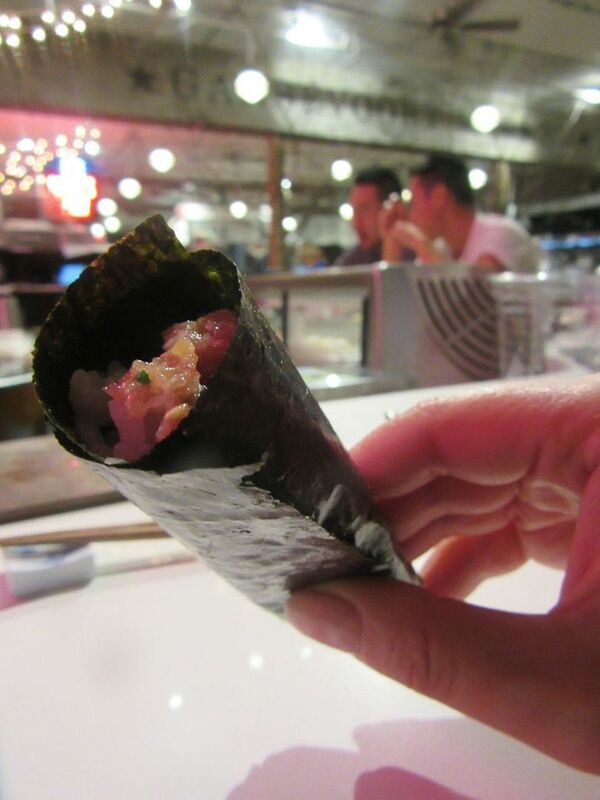 Here’s a photo of a handroll from my first Sushi byh Bae tasting in Gansevoort market. “What did you like about Bae?” I asked my sushi pal, my usual partner in these counter excursions. 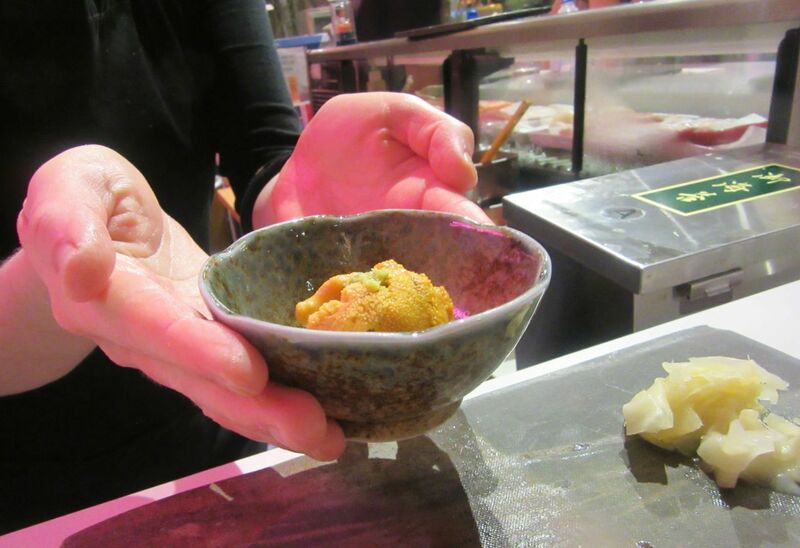 She enumerated the thrills: the imported fish, the sophisticated marinades, the kaiseki bowls. “Well, yes…maybe,” I thought. But to be honest, I couldn’t overcome a basic prejudice. Not even a bowl of sea urchin could lure me out of my shameful prejudice that evening. Me, the pushy feminist, I couldn't make the leap. She was a female. She wasn’t Japanese. She was very young with a small pert nose and dimples. I could imagine her making a tea party for her dolls. The black smock and black Japanese headband weren’t enough. Her pale hands, constantly washed, wiping her cutting space, did not fit my sushi expectation. 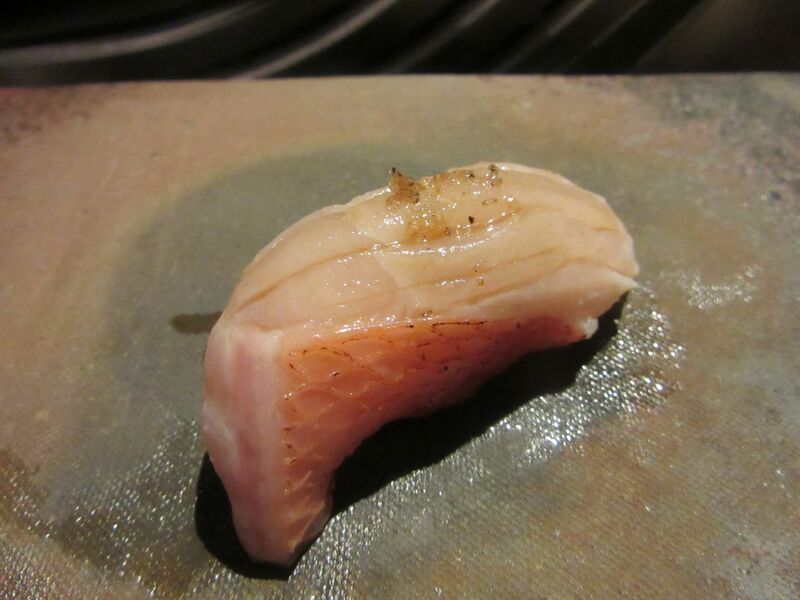 On my second tasting, I’ve surrendered to the cook’s style, her cures and washes as in this marinated blue fin. I’m not sure why I agreed to try Sushi by Bae again. Maybe all the affronts to women emerging at the moment made me want to purge outdated notions. 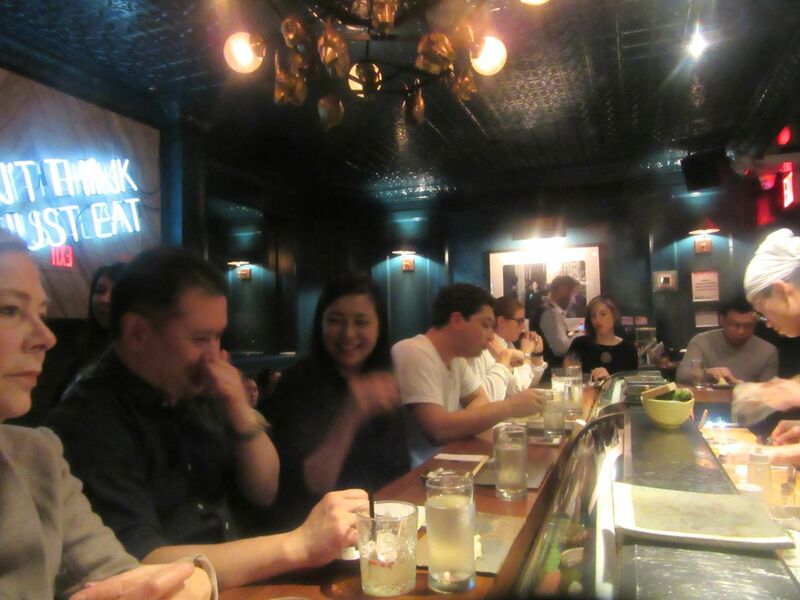 It was my sushi guru’s suggestion that we try Bae in its new perch at the Jue Lan Club in what used to be a church and then a disco on 49th Street just east of Sixth. I knew that fussy sushi fans I respected had become regulars. I wanted to give it another chance. “Sorry, I thought there would be an elevator,” my pal said, as we climbed an Everest of stairs and settled in a tight corner to wait. The stools would turn precisely at 7:30. David Bouhadena’s $50 sushi tasting by Bou still feeds half the counter next to Bae upstairs at Jue Lan Club. Tempest is still joined at the imported wasabi bulb to a team from Sushi by Bou, but now their workspace is in a handsome dark-green room with a corner station for the sake-cocktail-sommelier, a handsome brass chandelier with animals hanging, Warhol photographs at either end, and a wall with lights that spell out Don’t Think, Just Eat. She drew the logo herself: A blue fish with the face of a cat. 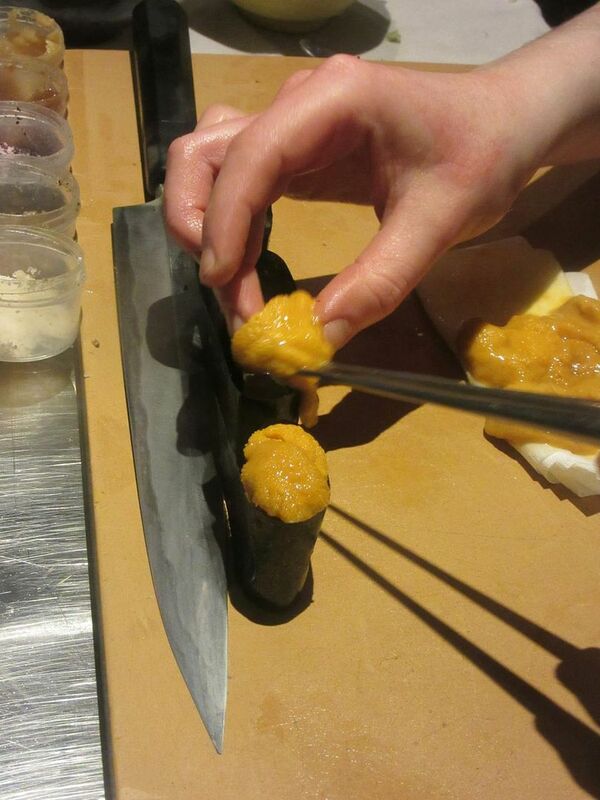 A box of fresh uni from Maine is set in front of us, an object of seduction. “I have uni that’s still in its seawater,” she promises by way of welcoming us, wiping her cutting space yet again, washing her hands, touching the pots and brushes of her “paints” and marinades, grating the precious wasabi into a potent paste she keeps alongside. I order a Bourbon Yuzu Honeybee cocktail. My friend asks for a modest sake. I recognize Bae’s Wednesday regular at the counter with a date tonight. Oona’s mother to his right. I recognize Bae’s Wednesday regular from our previous foray. He only needs to call if he’s not coming in. Tonight he’s with a date. And next to him, on my left, is a beautiful woman who doesn’t strike me as a sushi hound. (What aspect is that? 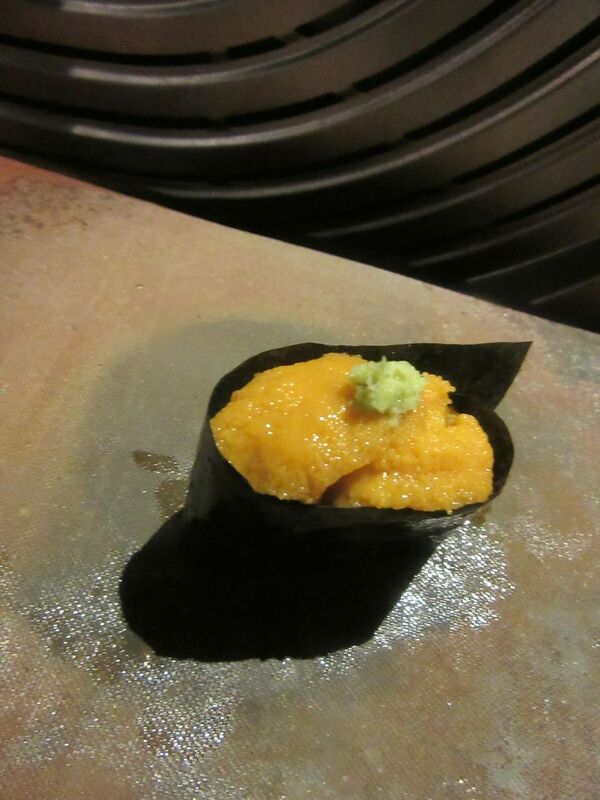 I think the usual sushi fan looks real, not perfect, expectant, nervous that he or she might not get enough sea urchin.) What can I say? This woman looks like Portnoy’s classic blonde shiksa who would insist her hamburger be medium-well done. Sea bream marinated in kelp and scored to curve over its tiny rice saddle. Indeed, she is Oona’s mother, Pia Post, an artist and designer specializing in lace and knitwear, visiting from her home on Martha’s Vineyard. The chef, under her scrappy dark hair, has the same pert profile. “She’s the most important person in my life and taught me how to take care of others by how she took care of me,” Oona will tell me later. 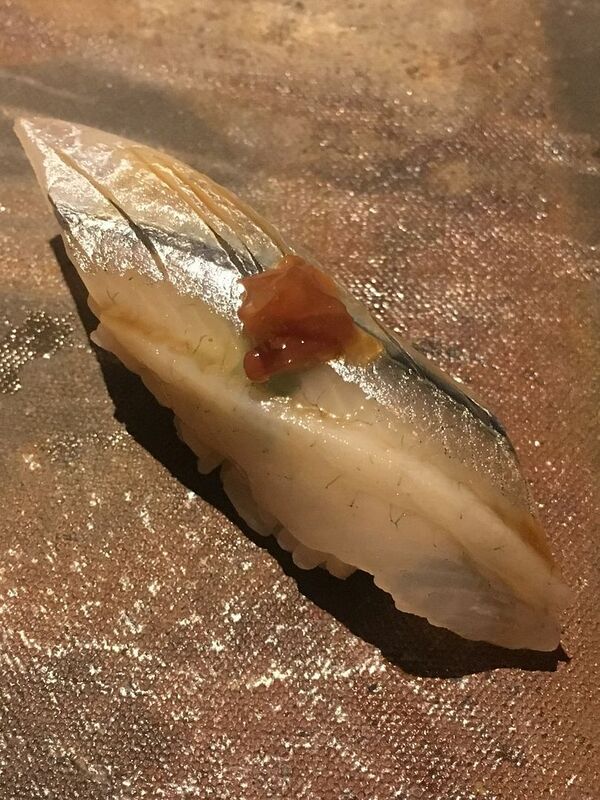 A sliver of sayori, Japanese halfbeak, with a button of umeboshi plum jam, is a special thrill. 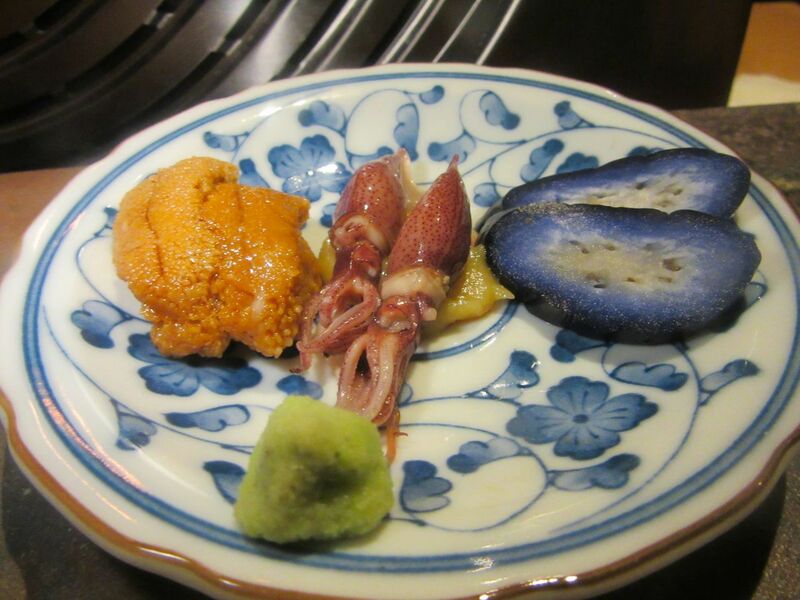 The opener tonight is a pair of firefly squid, uni from Maine, two slices of lightly pickled eggplant -- purple and crunchy -- and a dab of that explosive wasabi for each of us on pretty flowered plates. 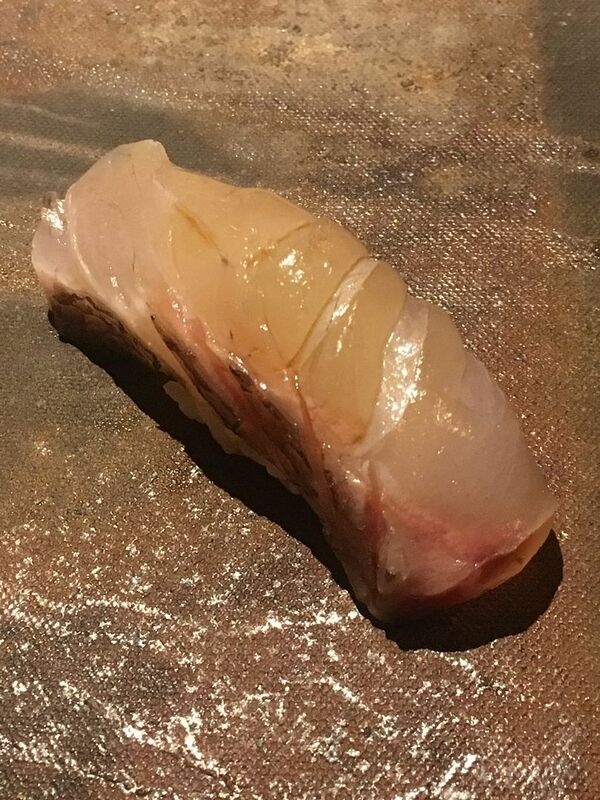 Japanese sea bream, aged with kelp, follows. 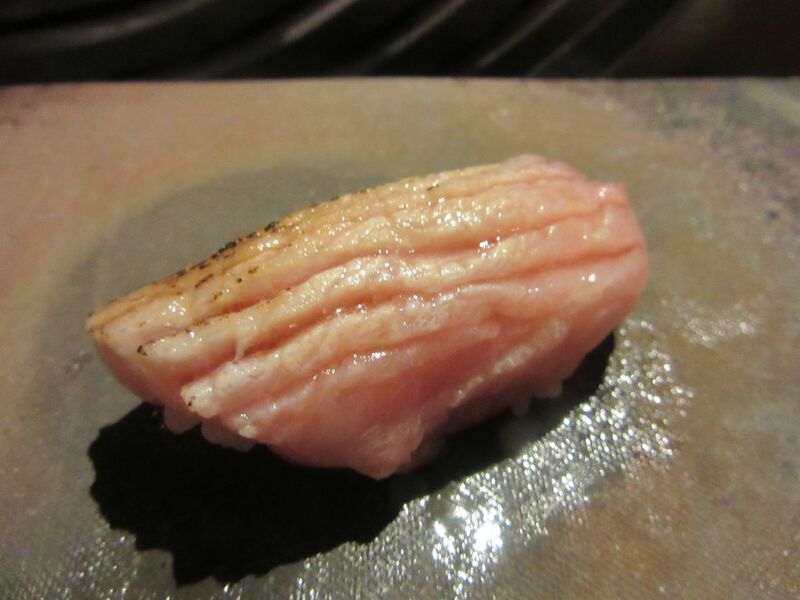 And then shima aji, striped jack. 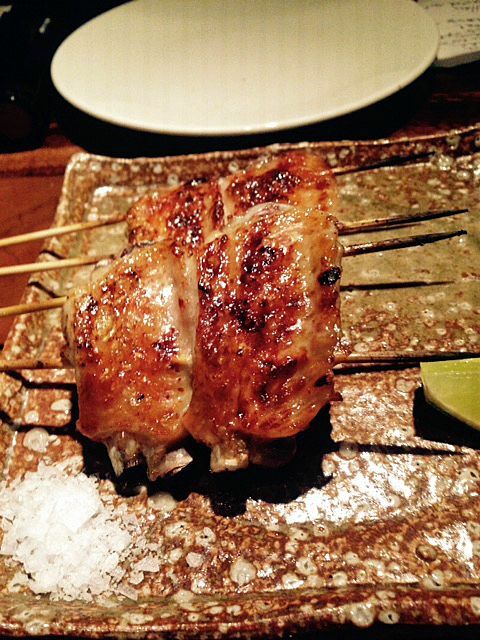 The sayori, Japanese halfbeak with a dab of sweet plum jam, fills my mouth with a chorus of flavors. My friend beside me and I both gasp. Barracuda scored and slivered and fired for extra flavor and style. Tempest is Oona’s middle name. “I use it because it’s something they both gave to me,” she says. 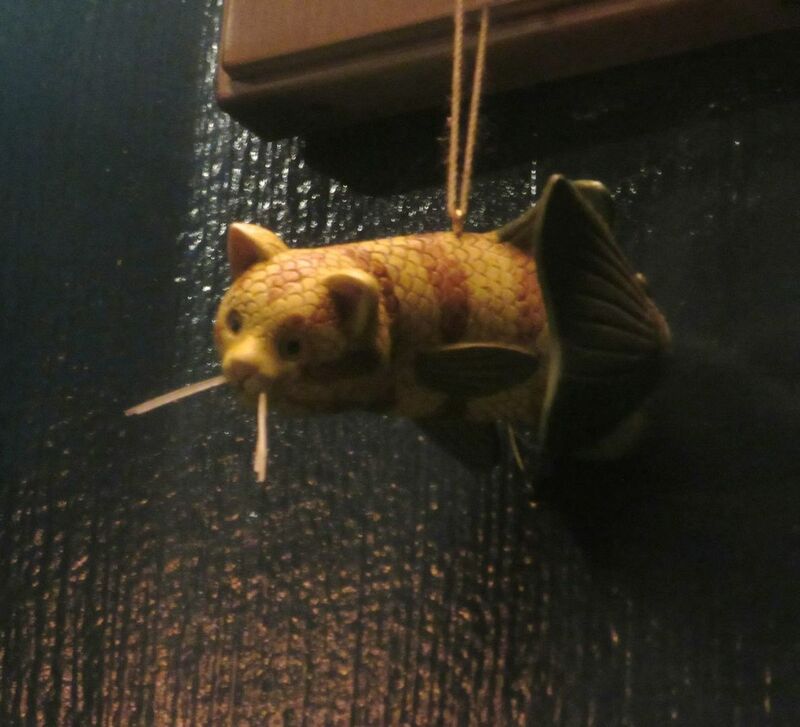 The Sushi by Bae logo, a fish with a cat’s face , inspired an admirer to give Oona this catfish mounted above. Oona grew up expecting to be an artist like her mother. She graduated from art school in New York. She liked to draw fish. A friend, working as a waitress at Tanoshi Sushi, asked her to cover a shift. Some alchemy occurred there. 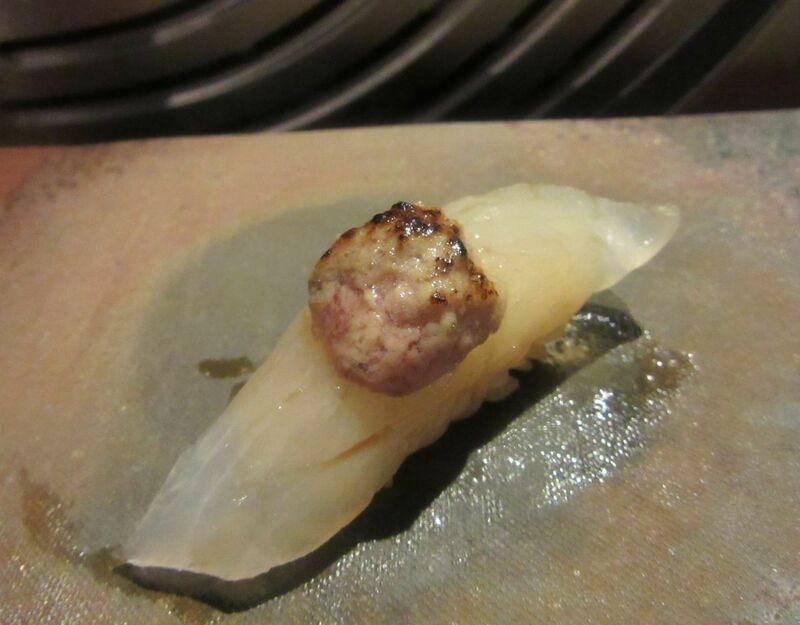 Chef Toshio Oguma at Tanoshi was willing to help her become a rare female sushi apprentice. After a long while with Toshio and a short time at Ginza Onodera, she chose to avoid the perils of being a female in sushi by opening on her own. 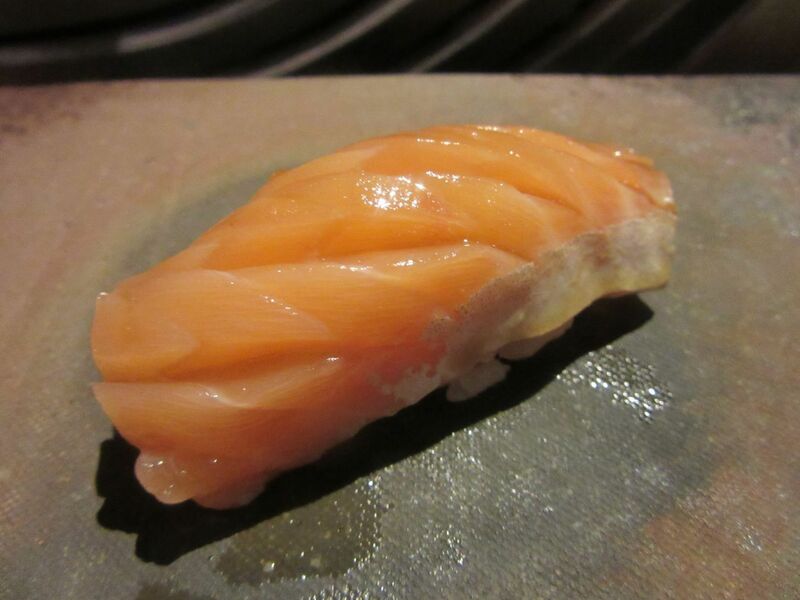 Sakura masa, cherry trout from Hokkaido is another show stopper. Kawahagi, the thread sail filefish, arrives mounted with a blob of its own liver. 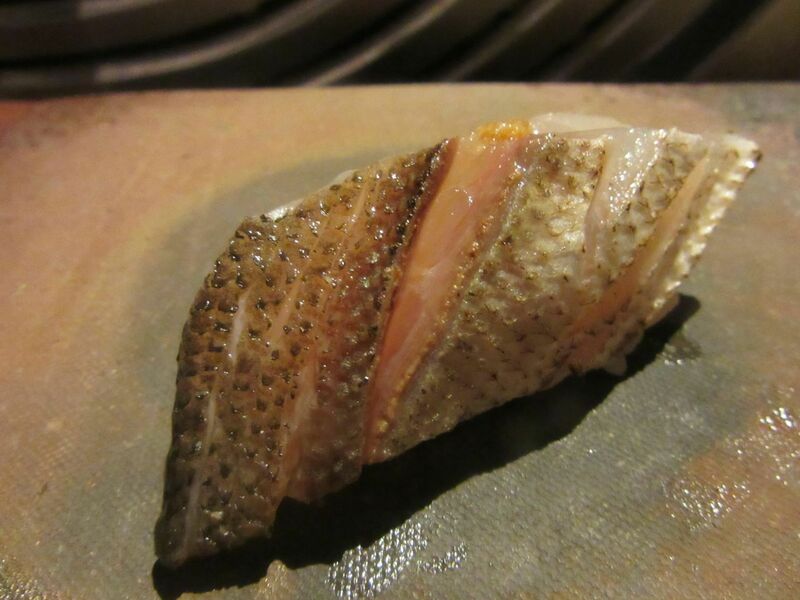 Tonight’s complex sliver of cherry trout from Hokkaido, the marinated blue fin and the kawahagi with a top- knot of its own liver illustrate her penchant for seasonings, smoked salts and various aging tricks that she uses on the fish she orders sent from Japan weekly. 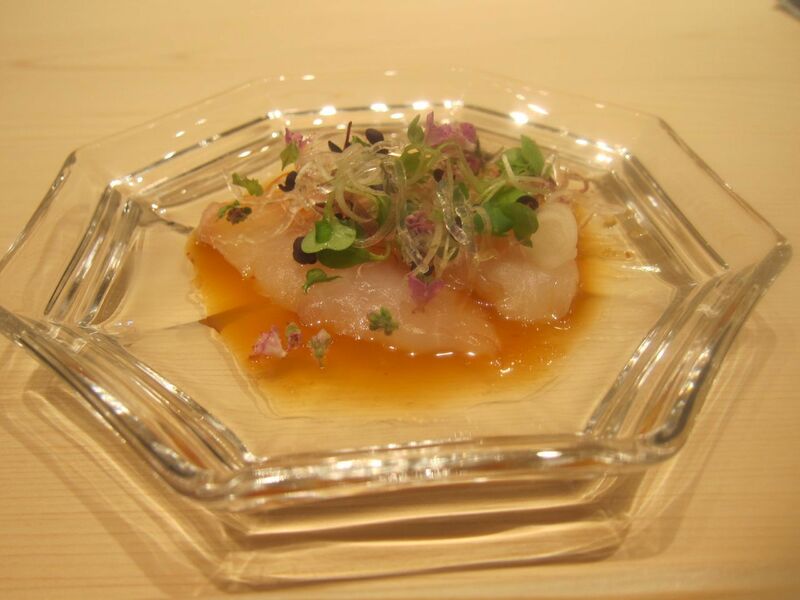 Licorice root sea salt is tucked into golden eye snapper, kinmedai from Shiba in Japan. She has compared squeezing the tiny rice saddles to working with clay. Every artist has a different hand, it seems. She scores and slivers the fish so it curves over the rice, often torching the cut edges. 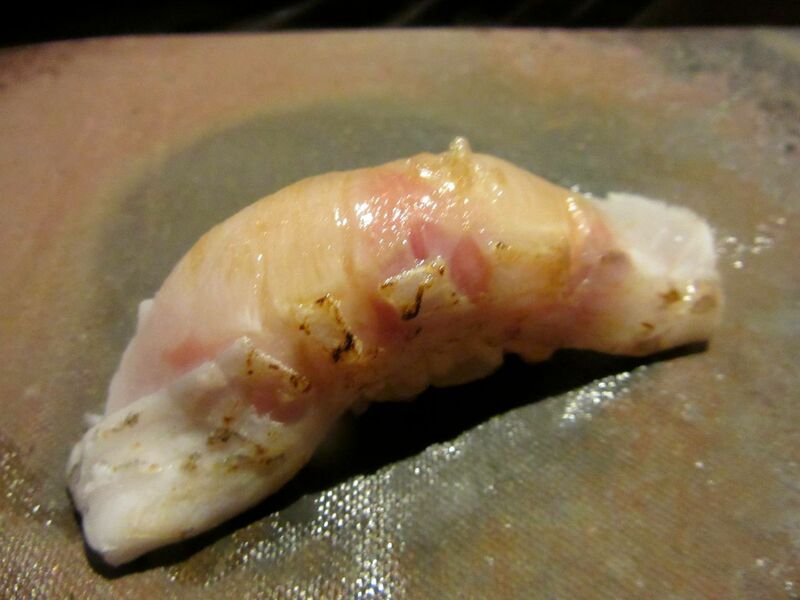 Akamitsu, known as black throat or fatty sea perch from Kyushu. Sometimes, as I reach for one of her swimmers, the fatty sea perch from Kyushu or the golden eye snapper with licorice root sea salt or the chutoro, I find the rice breaking apart. I wonder, in pacing myself I have let it sit too long? Or if it’s a fault of the rice or the hands? 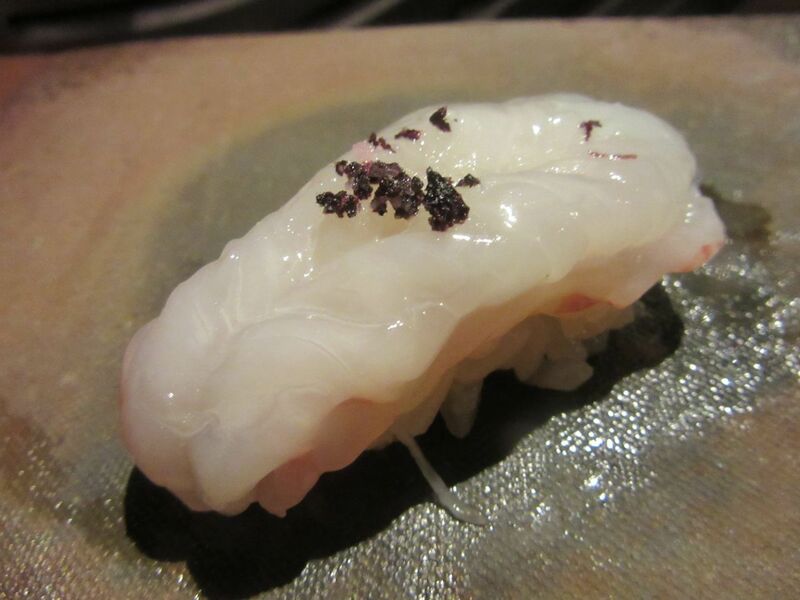 Thin layers of sweet raw shrimp seasoned with ume shio, plum salt. 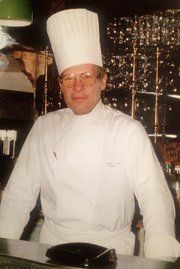 Occasionally the sharp brushing of citrus or vinegar, the salt, seaweed or miso cure, is a shock -- a distraction or a gift, I’m not sure. The glorious layered thins of sweet, raw baby shrimp with plum salt make a bite almost too large, too complicated to both contemplate and actually chew. Another gasp. 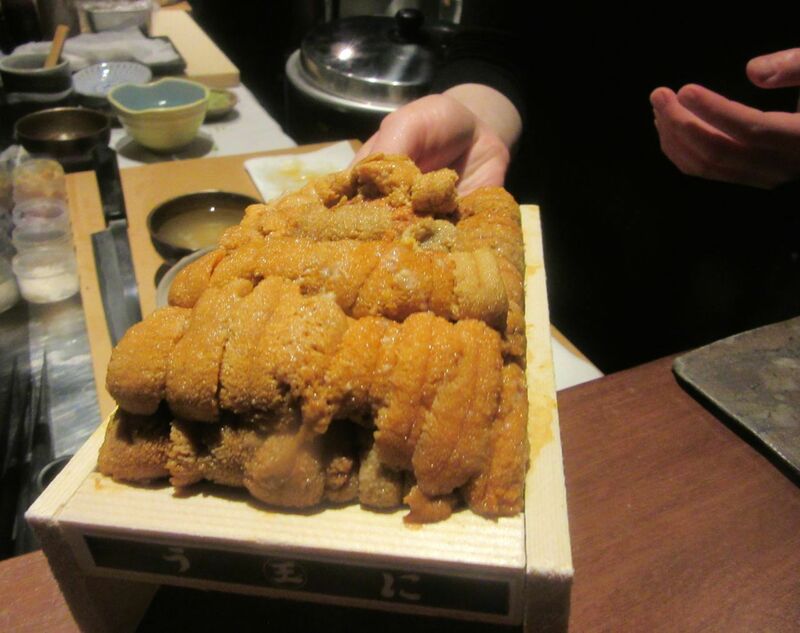 Oona Tempest divided a huddle of uni into belts of nori. The fish prep is an alchemy she has learned, along with storing and shopping and demanding a level of quality -- so much more than merely the knife skills that seem so obvious. She pulls out the floating uni next and fishes them from the water onto a paper towel. It means a lot that they have not been processed as most are, she explains. The sommelier brings each of us a gift of sake in a small tumbler. I study my neat uni packages a moment before making it disappear. Oona prepares a gunkan maki – “gunkan means battleship,” she notes – wrapping a strip of nori around the rice and piling uni on top with a hit of wasabi. Then comes a tightly rolled temaki too. On our first visit there were two or three kaiseki bowls but tonight just one: a pleasing toss of rice and salmon roe with a raw quail egg yolk and a scatter of chive to mix in. 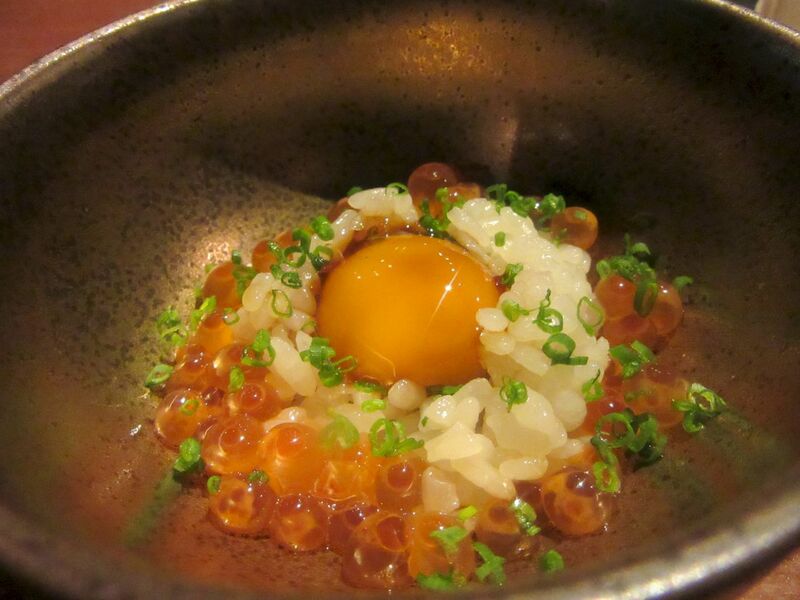 We are instructed to stir the cured quail egg yolk into rich and salmon roe in the bowl. She indicates that’s the denouement. I actually feel full. I don’t miss the classic tamago or matcha ice cream. Not that I’d mind pomegranate sorbet or the apple pie that makes me giggle at Shuko. My companion asks for a final toro. I’m not tempted to join her because I imagine my mouth is still haunted by the ghost of rice and salmon roe. 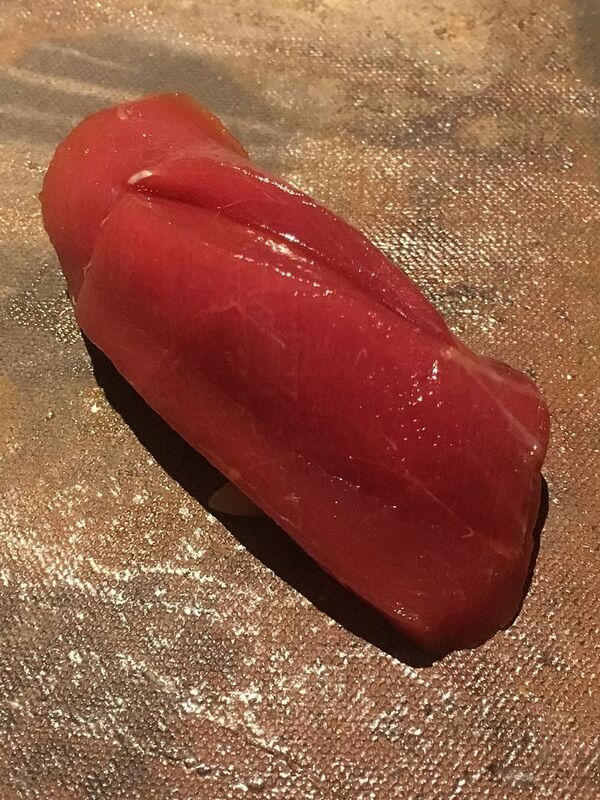 One more toasted fatty toro at $8, makes a heavenly code to the $100 omakase. We add a tip and sign the check on the waiter’s iPhone, $334.46. The final bill will arrive by email. An enchanted evening. It’s dark descending the too-many steps. I resolve not to trip. Jue Lan. 49 West 20th Street between Fifth and Sixth avenues. Text 347 495 4221 for reservations. Tuesday through Saturday 6 pm, 7:30 pm, and 9 pm.